Comparing the Big Three – What effect is institutional involvement having on Gross Lending rates? Our recent article ‘a dive into the Loan Books of Zopa, Funding Circle and RateSetter’ highlighted that one of the factors affecting the changing nature of the loan books of the big three has been the introduction of institutional capital. Since the arrival of P2PGI in May 2014 whole loans and loans not protected by a provision fund have both become features of the aggregate UK lending portfolio represented by the LARI. Both of these loan types are clear signs of institutional activity - it is exclusively non-retail buyers that take whole loans and it is only institutional buyers able to opt not to take provision fund protection. One trend that we identified in our previous article and that seems likely to be a function of increased institutional involvement is the evolving level and dispersion of lending rates at each of these platforms. In this article we investigate the quantum and distribution of weighted average lender rates further by splitting loans into retail and institutionally funded loans. For Funding Circle this involved splitting the loan book into whole loans and fractional loans and for Zopa and RateSetter this involved identifying loans not covered by a contingency fund. 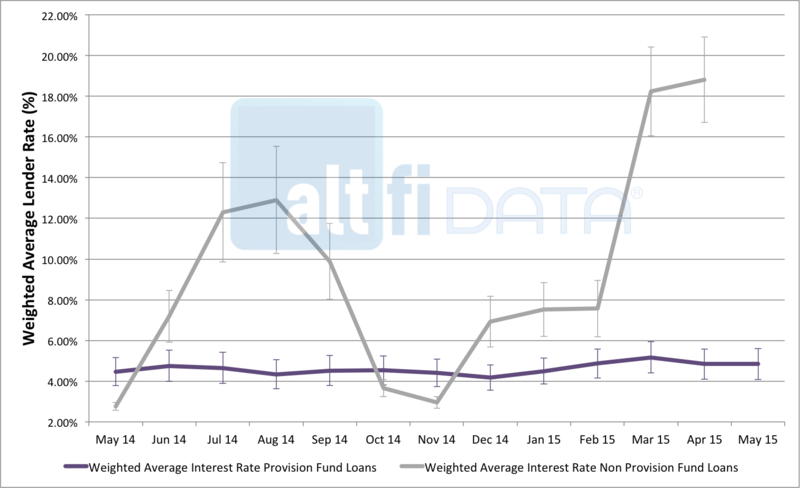 The weighted average lender rate for retail investors has remained relatively stable at around 4.5%-5%. In stark contrast the loans that are not covered by Zopa’s contingency fund have fluctuated considerably and generally gone through at much higher levels. In fact, since June, institutional loans have ranged at an average of between 7% and 17% - consistently above average and in some cases considerably so. The standard deviation of these rates has also been very high. Since September 2014, the dispersion on a monthly basis is as much as 2-4 times greater than that of loans financed by retail investors. It is clear that the advent of institutional capital has opened Zopa’s market to some higher credit risk borrowers. The dispersion of institutional lender rates falls broadly in line with the investment objective of investment trusts such as P2PGI who are targeting higher annualized returns than the industry benchmark (which is illustrated by the Liberum AltFi Returns Index). 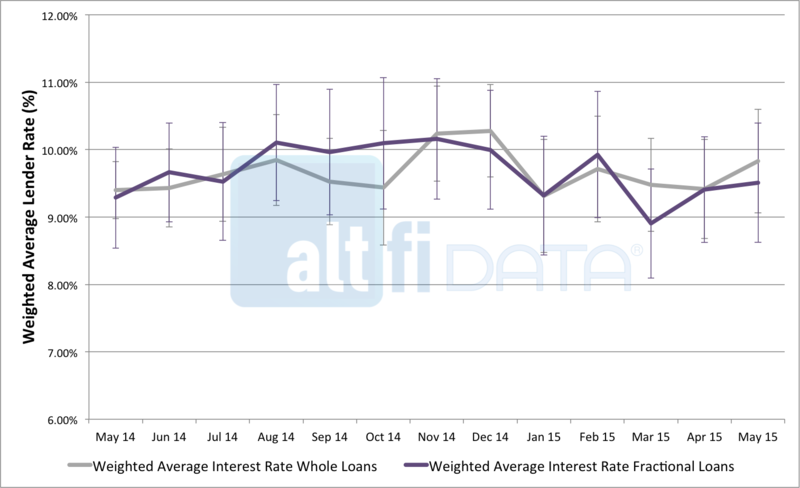 In contrast the weighted average lender rates for retail and institutional investors on Funding Circle have remained remarkably similar both fluctuating in the 8-9% range. The dispersion of lender rates is also commensurately narrow. This is striking – the disparity in rates seen at the other platforms has not occurred here as institutional and retail capital both seem to be funding the same, or at least very similar, loans. In conclusion it seems that Zopa and RateSetter have used institutional capital to grow into new areas of borrowing, and into what one would assume to be notably higher risk areas. Funding Circle on the other hand have used the new influx of capital simply as extra liquidity that co-exists alongside existing retail participation. These observations have some interesting implications. Firstly we should recognize what institutional capital has likely done for loan origination at the consumer platforms. It looks like loan origination should now accelerate as new borrower markets are being accessed. This is however not the case at Funding Circle where the new capital is simply extra liquidity to provide supplementary capital to the existing loan origination pipeline. Secondly it is interesting to note that whilst Funding Circle is a platform in which retail and institutional co-exist at the big consumer platforms institutional capital has heralded the arrival of a parallel market in which higher risk and return lending is engaged in by capital with a higher appetite. It will be interesting to see how this evolves – it could be that some of the retail lenders on the big consumer platforms might also fancy playing in the higher risk/return areas (if they’re allowed..).